We all love having our television sets hooked up to the net, in fact a quarter of all homes already have internet connected tv. Currently we are kind of cheating though as we use external devices such as consoles and blu-ray players to achieve this. 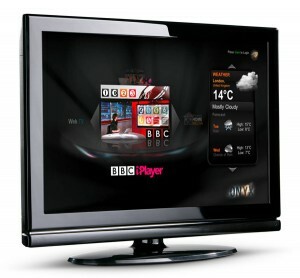 However, by 2013, 55% of all TV models manufactured and shipped out will have an in-built internet connectivity according to the Consumer Electronics Association. The new wave of televisions that come internet-connected will not need additional, messy seperate boxes, software installs or complicated setup procedures. Currently though, only a small number (18%) of new tv sets shipping come with built-n internet connectivity. As we speak, Google are planning to makeover your tv. In partnership with Sony and Intel, they plan to make your TV act more like a PC letting you access any website and online service from your remote. Intel are working with some of the big names in the industry to get its processors into internet-connected TVs. Samsung is working on its own applications platform. Yahoo has its widget internet TV service displaying widgets for weather, news, shopping and social networking which run across the bottom of the screen. Even while this is going on, some still feel that the public are still not ready to adapt to this new technology. Then others see it as a geberation thing. Those below a certain age, having gone from gadget to iphone and grown up with a pc probably find the basic tv boring and not interactive enough. They will be more likely to embrace connected TV. Whatever anyone thinks, internet-connected tv is coming hard and fast. Everyone will learn to adapt. The key is just to make it simple. Many old people are happy to use a microwave even though its a relatively new invention, because it does not require an instruction manual to use. Internet tv has to go the same way. Streaming Internet Movies Direct to Your TV. Blu-Ray Or Connected TV?